TS Rewind Update (2015-12-04) - Streets Fly-Through! We have excellent news to share with everyone today. That is quite a relief considering how somehow it has been a month since our last update; time flies too fast, events happen. For some, it was failed hard drives, for others like myself, it was multiple day power outages. But we're back and still going at it, and that's what matters - we persevere and push towards our goal of releasing a TimeSplitters game to the community and everyone else possibly interested in the series. Sean (or Damianaid) has been working hard on Warzone. He has been hosting livestreams on Twitch as he creates more assets for it, and he'll be showing off the level in its entirety when he's ready to. Speaking of livestreaming, I've been considering doing the same thing while creating environment art for Bunker and potentially other maps as well. How would a weekly 'show' sound? Voice what you would like to see from it! TS Rewind Update (2015-11-01) - Blowing Minds Away! Pardon our long absence, we have been working diligently all across the board and deliver quality work by the time we are ready to share the game to the starving TimeSplitters community, not to mention the many who have been unfortunate to not have the ability to play. Anyway, today we are going to share a few updates considering how long it has been since our last post. First off, Joseph Helline, one of our weapons designers, was given a huge workload from his company earlier this year, so his availability on our team had been limited up until last month. With that, he wanted to show you progress on the Tactical 12-Gauge, based from the powerful shotgun from TimeSplitters 2. Next up is Streets. I'm getting closer and closer to its completion, so I thought I would share the Blue team's base. Now, there are a couple more things to do that will affect this side of the map: I need to do a little more work to add snow to the crevices on the brick siding, not to mention applying flyers in the form of decals on the light posts and certain walls, not to mention the road paint as decals as well. Over all, I'm pretty happy with how this section of the map is turning out, but I still have a few more things to do. Feels funny to think that the last prop I'm working on is the plane that will circle overhead, and I'm working on that now. 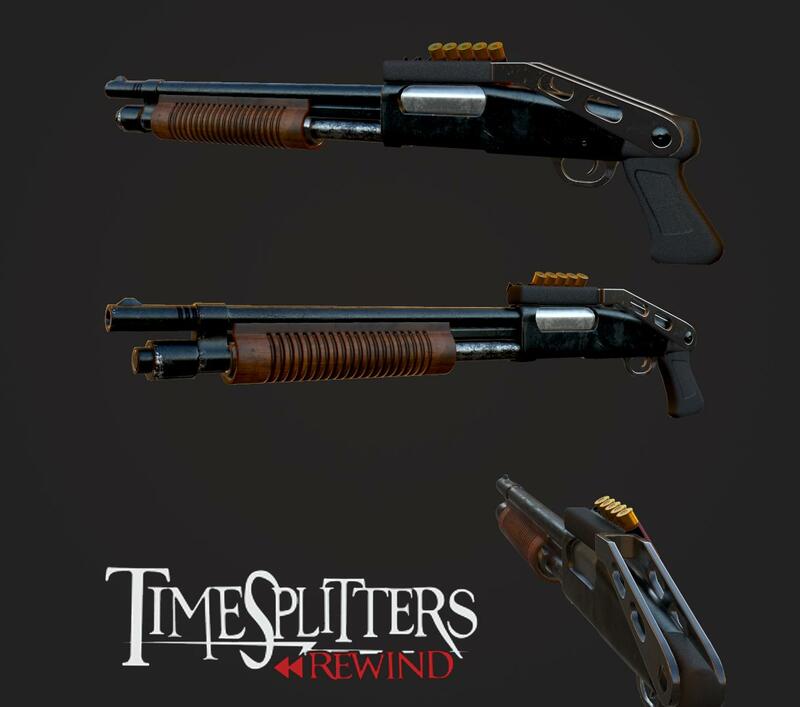 TS Rewind Update (2015-09-25) - Two Concepts Appear! Good afternoon or evening to the community. We have been creating assets left and right to get this project out to the incredibly patient eyes of the TimeSplitters community, all the while members continue to balance school, work, and Life, (the Universe, and Everything.) Without further ado, we have more information to share with you today. Momotaro has some excellent concept art he would like to share today over two maps he and I are collaborating on - Bunker and Hotel. Both are actually in playtesting state (Bunker has been in such state for quite a few months, come to think about it,) but they certainly need time for the both of us (plus a couple potential new members) to to create all those fancy props, not to mention what I have in mind for Bunker. Just think about the over-saturation of survival horror games... I think the satire of it in gaming is a little too low considering how many zombie killing games are around and all. We hope to share actual screenshots of these maps down the road. 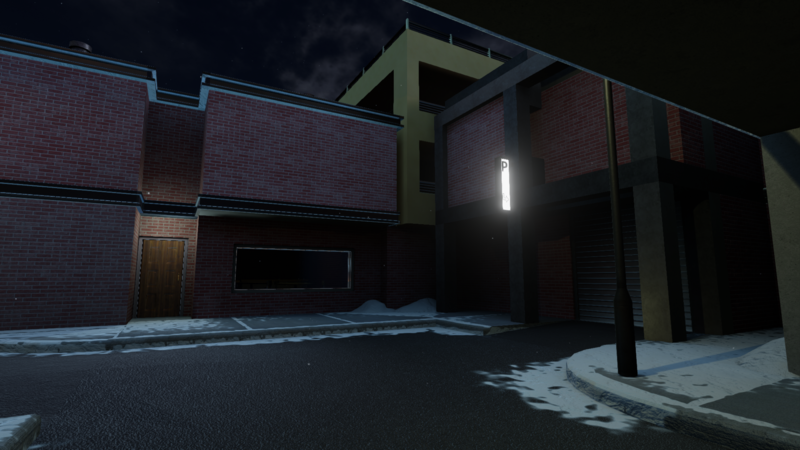 As for Streets, I have made a little more progress on it. I still have a way to go on a handful of environment art and another handful of texture sets, but I'm noticing there is a light at the end of the tunnel, so I almost feel relieved after all the late nights I've put into it! The map means so much to me, but it's time for me to wrap things up on it and focus on the other maps on my lineup. Enough about me. Now, if you would kindly visit Momotaro's ArtStation page, you will see his work probably in higher detail than what you will see on our Facebook album. That should do it for the week, now I'll go back and get Streets closer and closer to the 'finish line,' not to mention everyone else that has their own tasks are eager to complete them.